Adelaar liveaboard - Indonesian liveaboard in Raja Ampat and Komodo - Book now ! Adelaar has 4 beautifully crafted air-conditioned staterooms, each with en-suite bathrooms and all the amenities of a luxury boutique hotel. 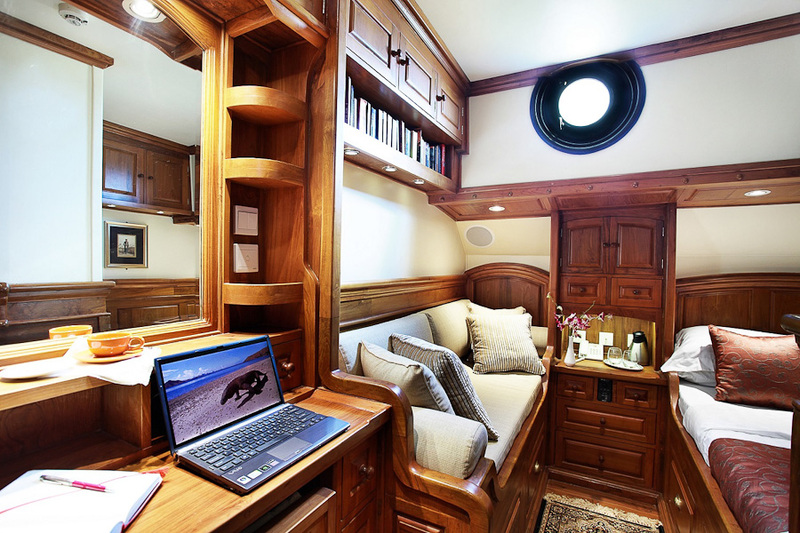 Built in 'classical yacht' style, the interior has rich wood paneling and high ceilings. 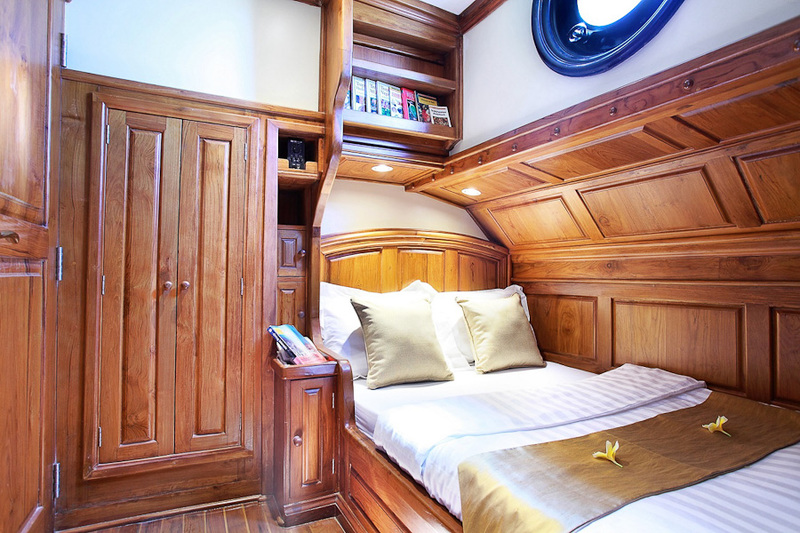 This boutique style Komodo liveaboard accommodates up to 8 divers comfortably, in four spacious and exquisite cabins, one master cabin and 3 staterooms. The exclusive master suite is fitted with generously high ceilings, a queen size bed, sofa and work desk, as well as abundant closets and drawer space. 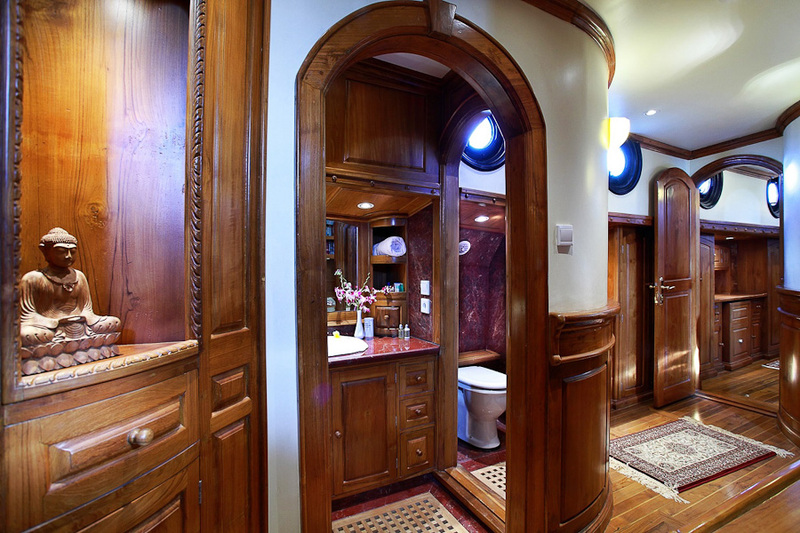 The master en-suite marble bathroom has a spacious shower, with separate sink and toilet area. The three guest staterooms each have double bed, individually controlled air-conditioning, and en-suite bathrooms. Two of the staterooms also have a sofa which can be converted to a single bed for children or for those wishing to have separate beds. 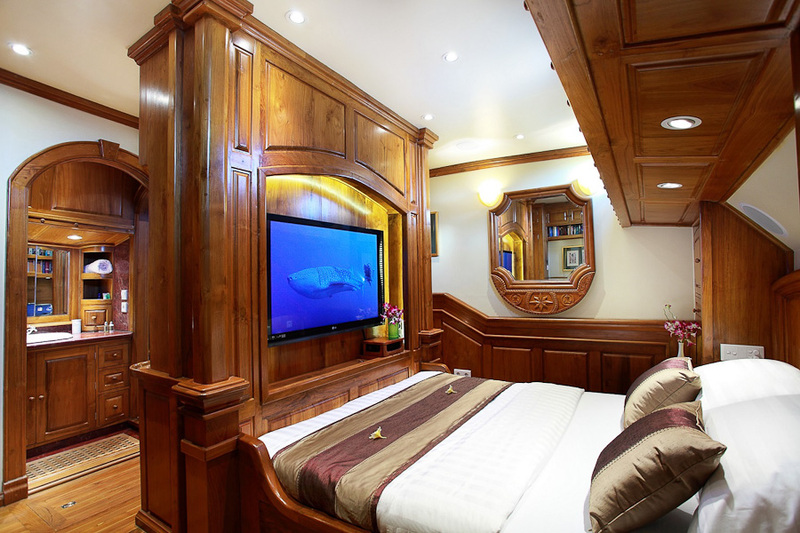 The master suite and the two staterooms have the capability of accommodating either couples or twin share. 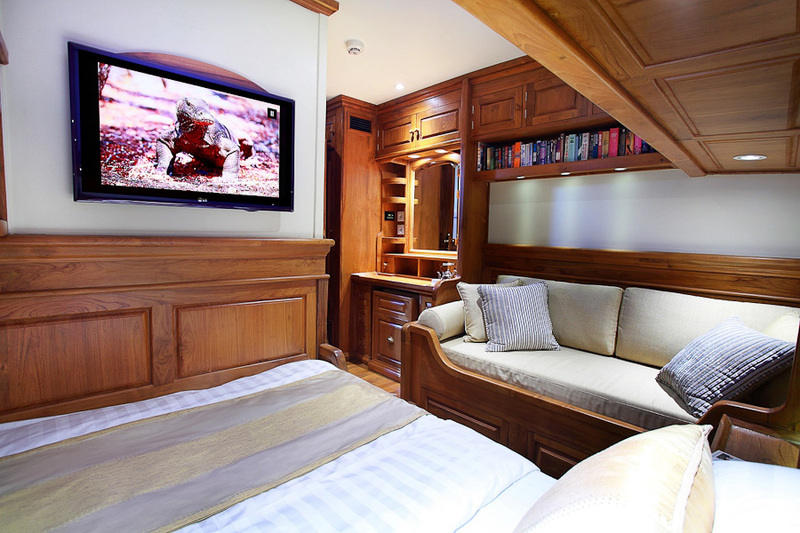 Staterooms are fitted with individually controlled air-conditioning, and boasts decadent en-suite marble bathrooms. Available in all cabins, as well as in the salon & dining area are flat screen TV's connected to the ship's video and audio streaming system with access to more than 3,000 movies and 30,000 songs if you should crave any entertainment. The main salon is a cozy and inviting area below deck. Relax on the sofa with a good book from your extensive library, challenge your partner to a game of chess at the game table, or write those postcards seated at one of your desks. Have the steward prepare a cocktail from your well stocked bar, also located on this level. Gourmet meals are served a la cart in the main dining salon, located on the upper level. Large windows provide a panoramic view of the vivid landscapes as you cruise through the Archipelago. The main deck has a large table and seating area, situated under an expansive sun awning, which provides the perfect spot for enjoying the scenery while cruising. The forward deck is fitted with comfortable cushions for relaxing and sunbathing. At deck level, Adelaar features a comfortable salon and dining area for guests. Adjacent to the spacious dining room, a fully equipped galley features top end BOSCH appliances from Germany. 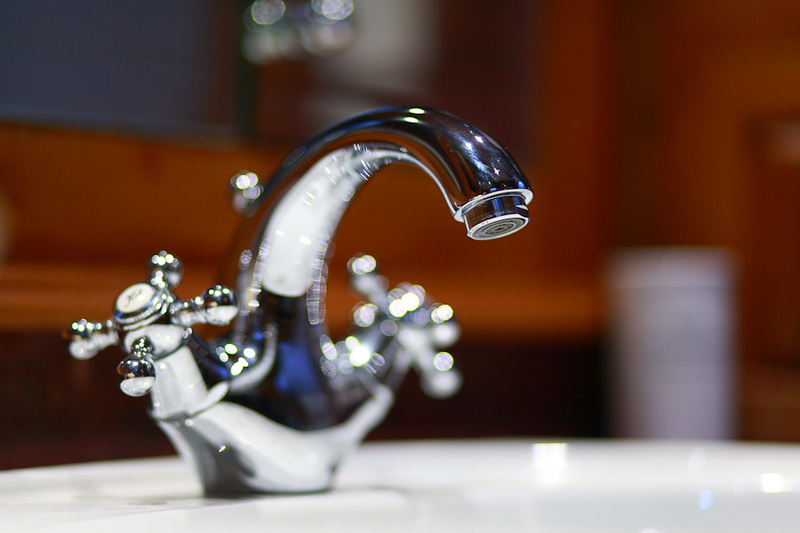 All areas below and at deck level are fully air-conditioned with individual temperature control. The upper deck houses a separate cabin for the cruise director, and the wheel house has fully compliant navigational equipment, and a spacious crew dining area. Air-conditioned crew quarters are located in a separate area in the bow of the ship. 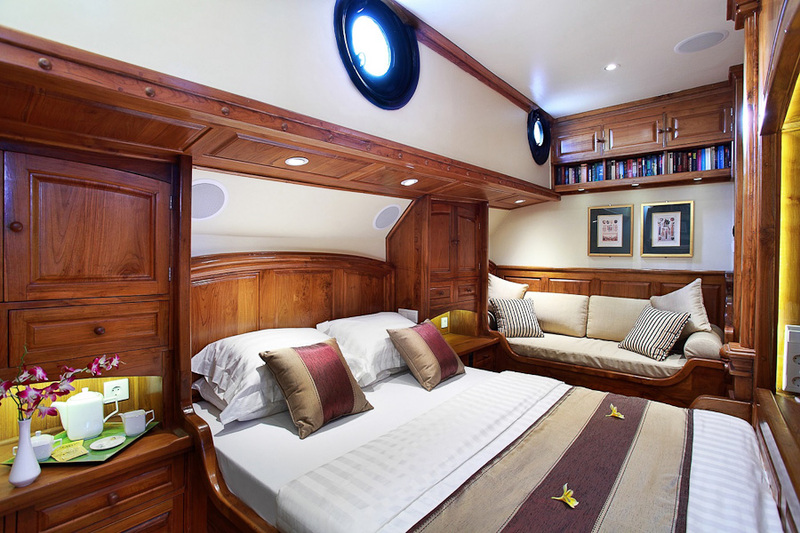 The beautifully decorated interior of ADELAAR is a classical yacht style with rich teak wood paneling. The high ceilings throughout the vessel give an intimate, yet spacious feeling. The main deck has a large table and a very comfortable seating area, situated under a large sun awning. This provides the perfect spot for alfresco dining and enjoying the scenery while cruising. your comfortable seating areas on the lower and upper aft deck are very inviting, whether it be for reading, relaxing, or having one of Agung’s famous Gin & Tonic’s! Prices are per person and in Euros based on 2 persons sharing a cabin. all harbor clearances (for Bali to Komodo itineraries). NITROX (180€ per trip or 10€ per tank fill) or customary tips to the crew. There is a Park fee of 160€ per person in Komodo or 235€ on one way trips from Bali to Komodo and reverse which is collected onboard for entry into Komodo National Park, Satonda Park and Moyo Island. Due to the unstable and forever fluctuating fuel prices in Indonesia we reserve the right to add a fuel surcharge. We anticipate that this would be in the range of 8€ to 15 € per person per day. This boutique style Komodo liveaboard accommodates up to 8 divers comfortably, in four spacious and exquisite cabins, one master cabin and 3 staterooms. The exclusive master suite is fitted with generously high ceilings, a queen size bed, sofa and work desk, as well as abundant closets and drawer space. The master en-suite marble bathroom has a spacious shower, with separate sink and toilet area. The three guest staterooms each have double bed, individually controlled air-conditioning, and en-suite bathrooms. Two of the staterooms also have a sofa which can be converted to a single bed for children or for those wishing to have separate beds. The master suite and the two staterooms have the capability of accommodating either couples or twin share. 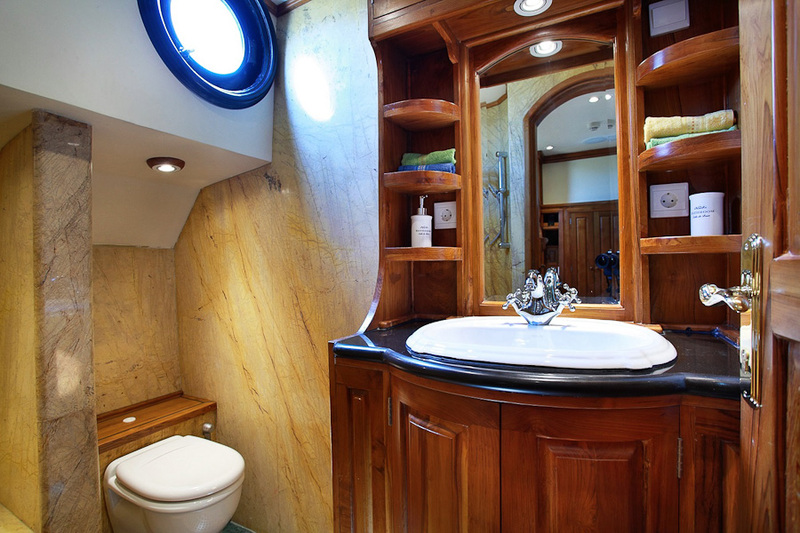 Staterooms are fitted with individually controlled air-conditioning, and boasts decadent en-suite marble. The signature Bali – Komodo – Bali cruise is the best way to explore Komodo National Park and its surroundings without the hassle of domestic flights. Dive all the famous (and more secret) Komodo sites and the best spots of Sumbawa. Sail between two oceans above mantas, dolphins and sharks. Day 1 You will meet at the wooden jetty in front of the Dolphin Lodge in Serangan Harbor at 08:00AM and set off along the coastline of Bali, cruising overnight to Satonda Island. Spend the day relaxing on deck, and wait for the magnificent sunset over the majestic Mount Agung. Day 2 Arise at your leisure for coffee on deck while your breakfast is being cooked-to-order. Once you arrive in Satonda you will head for 2 dives here, along a sloping reef. The white sandy bottom with bountiful coral outcroppings offers plenty of interesting things to see. Satonda - an old volcanic island, is famous for its salt water lake that filled the crater after the violent eruption of Mt Tambora, on Sumbawa, in 1814. Day 3 Rise early today for a glimpse of the sunrise as you arrive in Gili Lawa Laut, North Komodo. The park is located in the Wallacea region, denoting the overlapping of Australian and Asian bio-geographical areas. This overlapping indicates an interesting mix of bird species! There is a splendid assortment of dive sites just outside this picturesque bay. Typically in the north you have larger schools of fish, good visibility and some current. You might want to take the opportunity between dives to hike to the top of the hill to catch a glimpse of a magnificent panorama of the entire Komodo Archipelago just on the other side. You anchor in a quiet bay for the night. Day 4 A very early morning, as you head ashore by 07:00 AM to meet your ranger for a guided hike into the interior of Komodo Island, to seek out the prehistoric dragons Komodo is so well known for. This area is recognized as a World Heritage Site and also newly designated as a ‘new 7 wonder of the world’. Once back aboard, you are served lunch outside to enjoy the beautiful view as you head to the south of Komodo. You will make a stop along the coast for diving, then continue on to Lehok Sera for a dusk dive to search for those shy and elusive mandarin fish. You anchor for the night in a picturesque bay. Day 5 You make your way to Langkoi weather permitting, on Komodo’s south coast. You are on a mission to seek out manta rays today! You will attempt to fit in 2 dives here where these magnificent animals gracefully feed in these nutrient rich waters. After which, you move to Nusa Kode. With the towering cliff walls surrounding all sides, the landscape in this remote area is breathtaking. Get ready for your first macro dive of the trip here! After some excellent diving, you will have a shore excursion of sorts to get up close to the resident dragon population here. There will also be a night dive, and then dinner to finish off the day. Day 6 Mornings and evenings in Nusa Kode are a time where you can spot dragons wandering along the beach foraging for food. Monkeys, deer and lots of birds are also known to make an appearance. If sea conditions are good, you’ll be able to dive the ‘macro temple” of Cannibal Rock - a must dive for muck diving enthusiasts. During lunch you journey up back north for diving in Padar, where temperatures start to get warmer and visibility gets a bit better. Day 7 You leave Padar and enter an area known as ‘current city’ for your diving day. Despite the intimidating name, you are often guaranteed better visibility and larger schools of fish here! In the late afternoon, your vessel will move up north to Rinca or Wainilu. At Wainilu, opt for a short walk up a small hill for a nice view of Rinca and the surrounding islands. You anchor for the night in and there is a chance to do a night dive in Wainilu. Day 8 You spend the morning around the northern most boundary of the Park off the uninhabited islands of Gili Lawa Laut and Gili Lawa Darat to dive the best sites that you saved for last! In late afternoon you leave the Park area and make your way to Banta Island where you anchor for the night. A night dive is planned here. Day 9 You arrive in the volcanic island of Sangeang for some amazing diving on the flanks of this active volcano. Black sand with yellow areas (sulfur deposits). In places, gaseous sulfur seeps from the grounds, creating an underwater Jacuzzi with a warm sea floor. As you depart, the crew will put up all the sails for a brief photo opportunity and gives us a glimpse of The Adelaar in full glory. You sail through the night for Moyo Island. Day 10 You arrive Moyo Island early this morning for 2 dives on the fringing reef. There is a shore excursion to the village to see the traditional houses on stilts. You visit a local school, and then take a walk through a road lined with ‘living fences’ to visit a nearby waterfall. The local guide points out teak & cashew trees as you pass through herds of goats and water buffalo. While you are gone, the crew will have washed and dried all your dive gear. This means once back aboard, you can sit back, relax, and enjoy a gourmet lunch as you head back, bound for Bali. Day 11 You arrive in Serangan Harbor, Bali approximately around 09:00 AM and say goodbye to your Captain and crew. Transfers can be arranged to take you to your next destination. Please ensure your onward travels are planned to anticipate delays during cruising - Flights out should only be scheduled after 18:00 PM. This special cruise is inspired from our usual Bali-Komodo-Bali cruise but has been adjusted in order to discover the Komodo National Park in the best way possible at this season. We will still follow the usual route and dive the best sites all over the Park, but we will focus on spending more time in the southern part of the Park (South Komodo, Nusa Kode, Padar) during the few months where the visibility and weather conditions improve greatly. This itinerary grants the Adelaar guests more time exploring Komodo as less time is spent traveling long distances. This is ideal for people who wish to explore the island of Flores and its amazing wonders, or simply focus more attention on the Komodo National Park. National Park & Marine Reserve fee on these “Komodo extended” trips: 150€. Together with a marine biologist, we focus on a few scientific trips with a special itinerary including a stop where whale sharks tend to be seen. Think our Bali-Komodo-Bali with a special bonus! There are of course no 100% guarantees but we do know a secret spot. Don’t ask us where it is… it’s a secret! For the most part, the route will still follow our signature route and visit all the best sites of the Komodo National Park. This trip includes diving in Maumere, Alor and in between, visiting a village of headhunters, etc. The diving in Alor is a heaven for macro in the bays but also offers the opportunity to encounter big things along the colorful walls and drop offs of the islands located in the Pantar Strait. You should expect current and advanced diving. The fishermen and their children often dive in to meet the divers on their safety stop and tend to their traditional fish traps which make Alor famous. 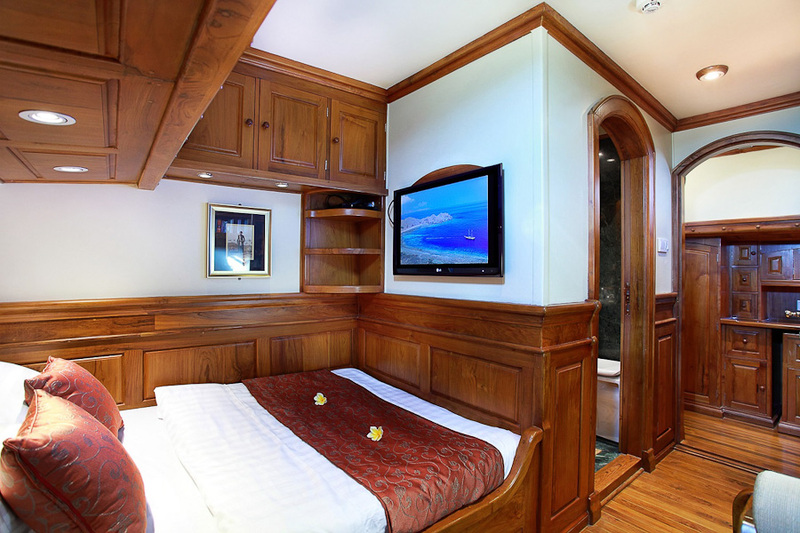 All 4 staterooms are individually air-conditioned and have en-suite bathrooms with hot water shower, toilet & wash basin. Our state of the art entertainment system allows on demand movies and music. The coral triangle is home to the world’s most bio-diverse population of marine species with Indonesia representing its hottest spot. Nowhere else has a comparable density, not to mention diversity, of underwater creatures and life been recorded. In order to fully appreciate the exceptional status of this region, suffice it to say that the whole Caribbean area has only 9% of the corals and 35% of the fish species found in Indonesian waters. The reason for such a big difference is that the entire area of the Atlantic Ocean underwent a mass extinction of species during the last ice age. All types of corals and animals vanished during this period and the other species never regained the strength of their former numbers. In Indonesia - the centre of this biodiversity triangle - the variety seen underwater is truly astonishing. In certain bays and around small islands, you can find more species than in the entire Caribbean. In a research report conducted in 1997 on the island of Flores, respected marine biologists Rudie Kuiter and Gerald Allen counted 1,133 species of fish just in Maumere bay. This is still the highest number of species of fish ever counted in a specific area. Drift diving, pelagics melting pot and critters maze: dive in one of the world’s hubs of underwater activity. What airlines fly into Bali international Airport? Bali International Airport has a taxi counter located just outside the arrival hall. The rates are fixed and you prepay to the counter. Your taxi driver will accompany you from the counter to his taxi in the parking lot. We can arrange a private car and driver if you would like to be met at the airport and taken to your hotel. How do I get to the ADELAAR on the morning that my trip is boarding? You can organize a transfer with the concierge at your hotel or if you prefer, we can arrange a private car and driver to meet you at the hotel and transfer you to the harbor. Please note there is a charge for this service. Yes, our marketing manager, or someone else of our support staff who speaks fluent English, French and German, will contact you at your hotel to confirm last minute details. Upon booking your trip, please provide us with your flight details as well as the name of the hotel you will be staying in Bali. You may call +62 81 2387 4313 prior to departure from your home country or once in Bali. Please, also send us your contact phone number by email. Why are you departing from Bali and not from Labuan Bajo or Bima? By departing from Bali, you can avoid traveling on the local inter-island flights. These flights are often delayed or even cancelled without notice. Luggage can be pulled off to make room for cargo at the last minute. Sailing from Bali, and returning to Bali, avoids such complications associated with these flights. Are ADELAAR trips suitable for families with children? Yes, of course! Children love the ADELAAR and all the excitement of sailing, snorkeling and visiting villages, and of course those Komodo Dragons are always an eye opener. We have accommodated many families with children, and all have said it was the perfect family vacation! I am a vegetarian, will this be any problem onboard ADELAAR? Our cooks are more than happy to accommodate your wishes for special foods. However, we need to know this in advance as all food shopping is done in Bali prior to the trip. We are a group of friends and want to charter the whole boat, is this possible? Of course this is possible, please contact us for options. Having the whole boat for a group of friends is ideal! I am a new diver and have heard that the dive sites in the Komodo National Park are for experienced divers only. Will I be able to manage the dives? The beauty of the Komodo area is that there are many dive spots with different difficulty levels - from beginner to very advanced. Our dive master will customize each itinerary based on the experience level of the divers. As a beginner, you will still be able to see remarkable underwater sites in the Komodo National Park. Does ADELAAR also sail to other areas in Indonesia, or do you always go to Komodo? While most of our trips are for diving or sailing in the Komodo Archipelago, of course, we also do trips to Alor, Sumba and Savu as well as to south Sulawesi, or even Raja Ampat.